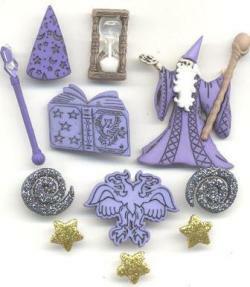 Lovely pack full of wizardy buttons: 1.5" Wizard, wand, hourglass, stars & swirls. Mixture of shank and flat back. One for the girls! 1.5" Mermaid. This one is for the boys! 1.5" wide Pirate ship. 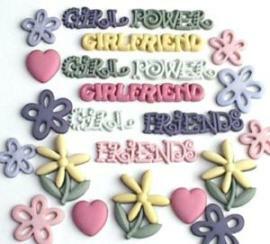 Lovely pack of assorted girlie buttons. 1 1/4"W carousel horse. Contains both shankback and flatback pieces. Pink ballet slippers. 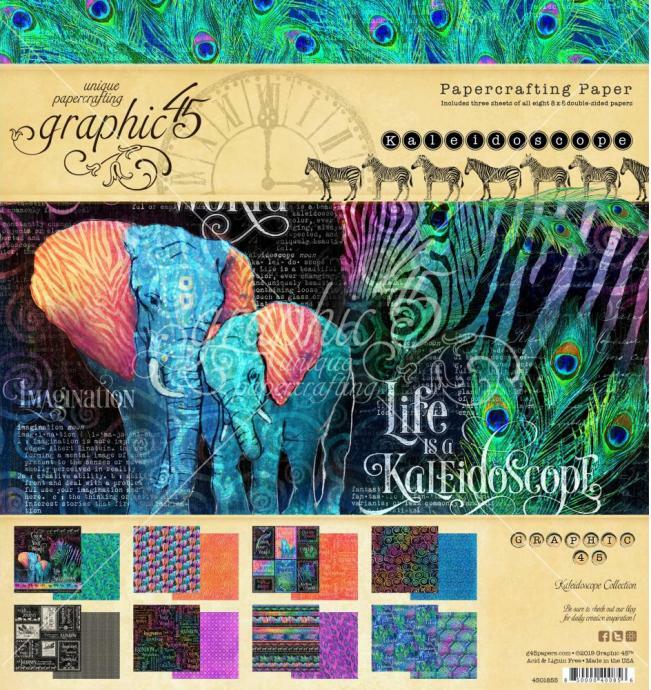 Superb embellishments for card making and scrapbooking. 1 1/8" high. Flat back. 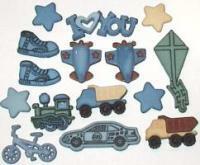 Boy themed pack with a great assortment of boots, kite, aeroplanes, bikes, car, truck, train, and more. Kite is 1 5/8" high. 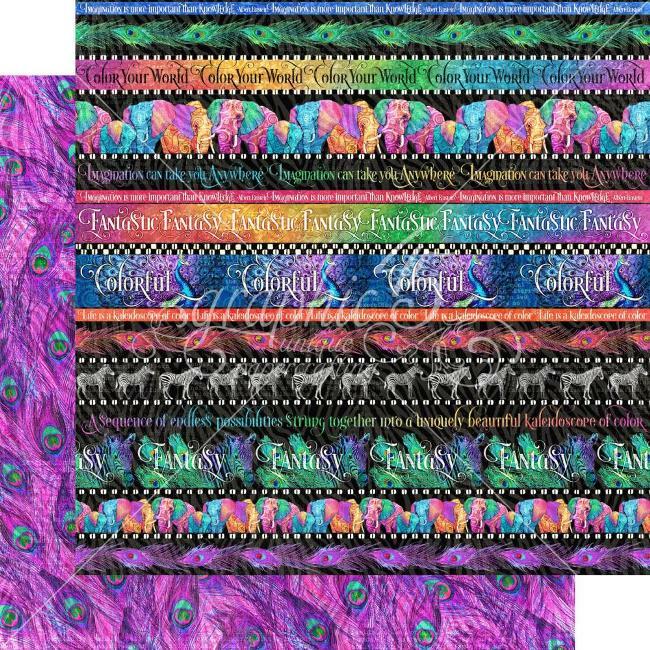 Superb embellishments for card making and scrapbooking. Tiny shapes featuring an array of "boys things". All flat backs. 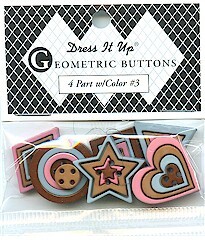 Superb embellishments for card making and scrapbooking. 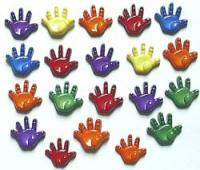 Pack contains primary coloured hands. 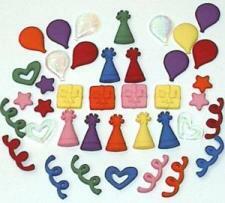 Superb embellishments for card making and scrapbooking. A great assortment of "girls things", including tiaras and bags. 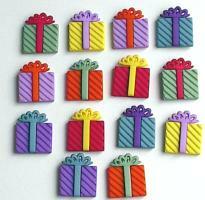 Superb embellishments for card making and scrapbooking. A girl likes to look pretty and here is a super assortment to ensure that she does. Compact is 7/8". 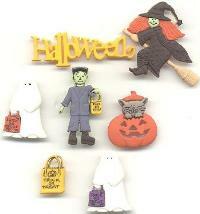 Superb embellishments for card making and scrapbooking. "Princess" banners, fairy castle, horse, dress, and much more. Super pack for little girls. 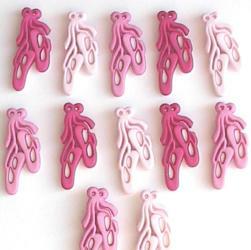 Superb embellishments for card making and scrapbooking. Pack contains trucks in assorted colours. 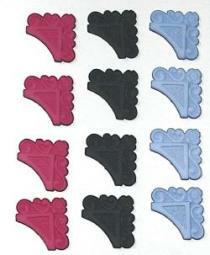 Each truck is 1" wide flat backs.Superb embellishments for card making and scrapbooking. 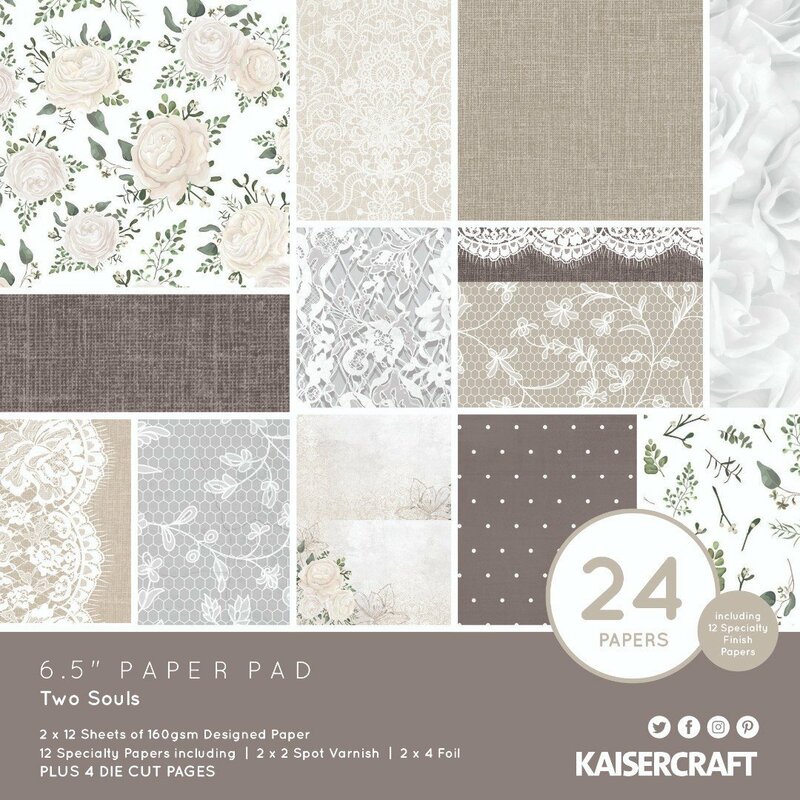 Super pack for teen cards or scrapbook projects. 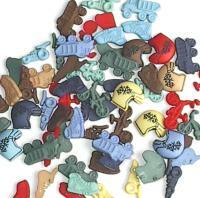 Pack of assorted dinosaur buttons. 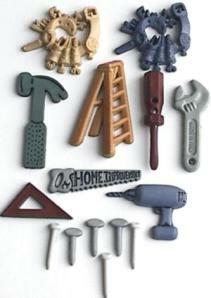 Great for little boy projects. 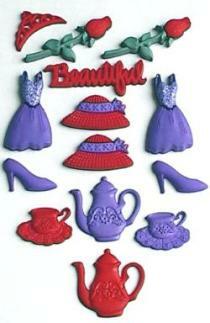 A lovely selection in red and purple, featuring hats, dresses, shoes, roses, teapots and cups, tiara, and "Beautiful" banner. 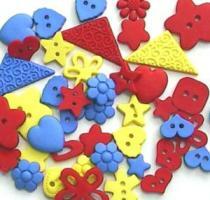 Superb embellishments for card making and scrapbooking. Beautiful red and purple hats. 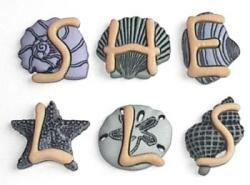 Superb embellishments for card making and scrapbooking. Mixture of shank & flat backs. 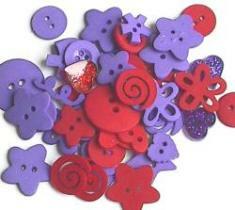 Coordinating red and purple buttons for the "Hats" series above. 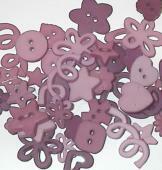 Superb embellishments for card making and scrapbooking. 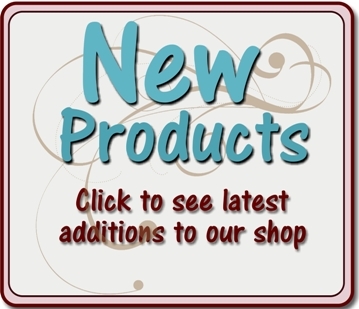 Ball gowns, handbags, shoes, mirror, lipstick, perfume, and compact in lovely hues. 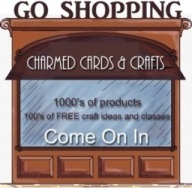 Superb embellishments for card making and scrapbooking. An assortment of polka-dot bikinis. 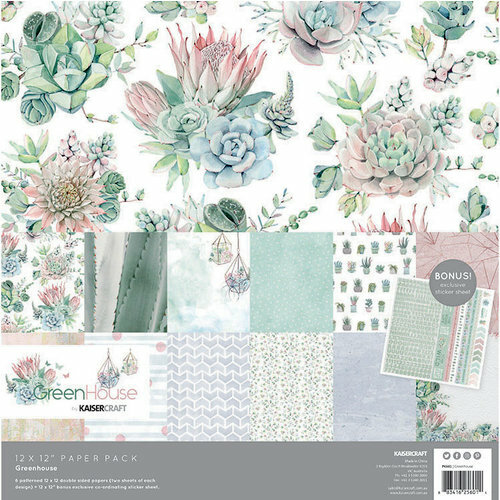 Superb embellishments for card making and scrapbooking. 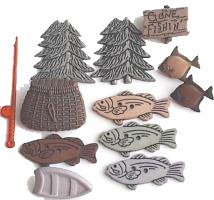 Another super fishing pack containing trees, fish, "Gone Fishing" signpost, canoe, basket, and fishing rod. 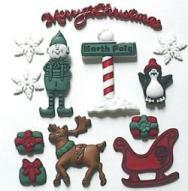 Superb embellishments for card making and scrapbooking. Note that contents may vary. 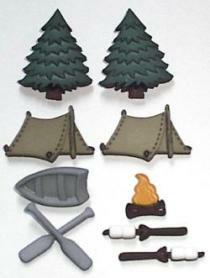 Pack of "Little Camper" flatback buttons. Pack contains trees, bear's footprints, walking boots, tents, canoe's and paddles. 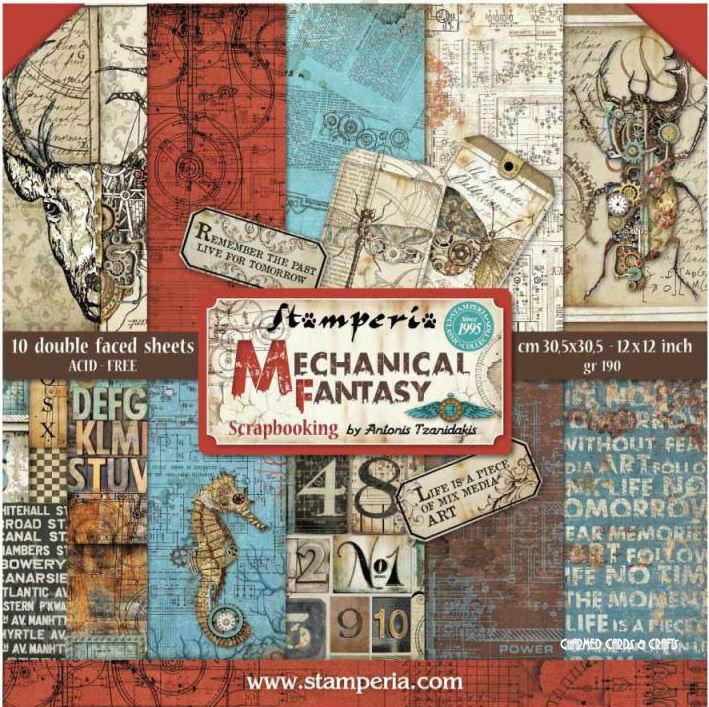 Superb embellishments for card making and scrapbooking. Contains all the tools needed for a handy Mr Fix It. 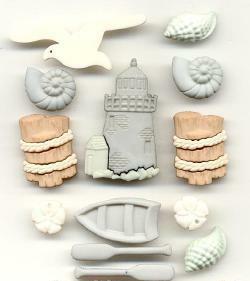 Superb embellishments for card making and scrapbooking. The height of the ladder is 1 1/2". All are flatbacks. Does this pack not make you want to camp out? 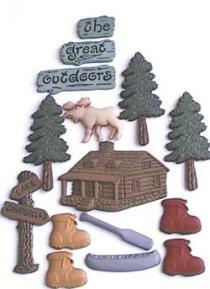 Pack contains a 1 7/8" log cabin, moose, trees, boots, canoe and paddles, and signs. 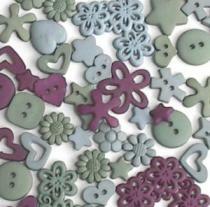 Superb embellishments for card making and scrapbooking. You can almost smell that camp fire! What a super pack for the guy in your life! 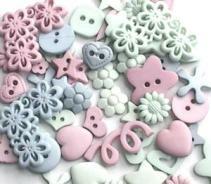 Superb embellishments for card making and scrapbooking. 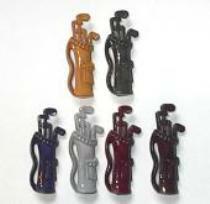 Another great button pack for the golfing enthusiast. 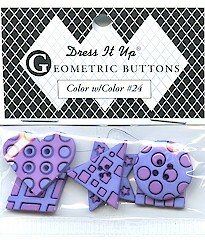 Height of each button is 1 5/8"
Superb embellishments for card making and scrapbooking. 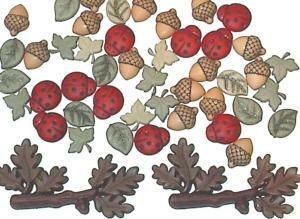 Pack contains acorn, ladybirds, leaves, and branches, in lovely Autumnal hues. 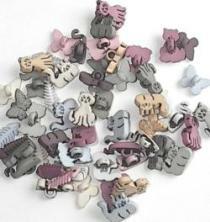 Superb embellishments for card making and scrapbooking. Gorgeous flatback leaves in shades of green. 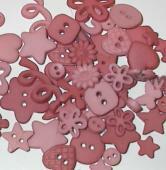 Superb embellishments for card making and scrapbooking. Size of the largest leaf is approx 7/8". 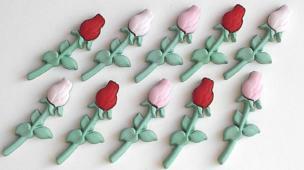 1 3/8" flatback roses in various colours. 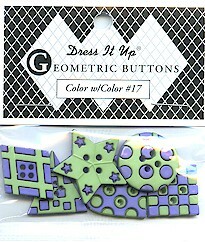 Superb embellishments for card making and scrapbooking. 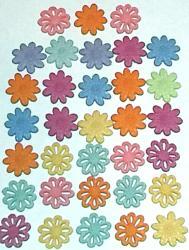 7/8" flatback brightly coloured flower heads. 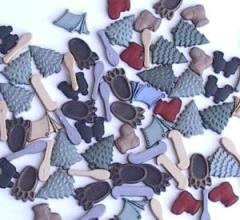 Superb embellishments for card making and scrapbooking. Beautifully coloured 1" flatback flowers. 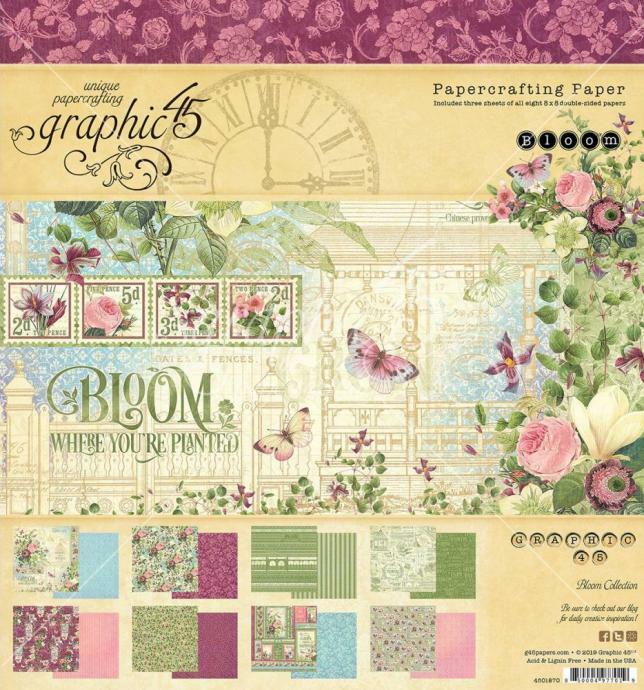 Superb embellishments for card making and scrapbooking. 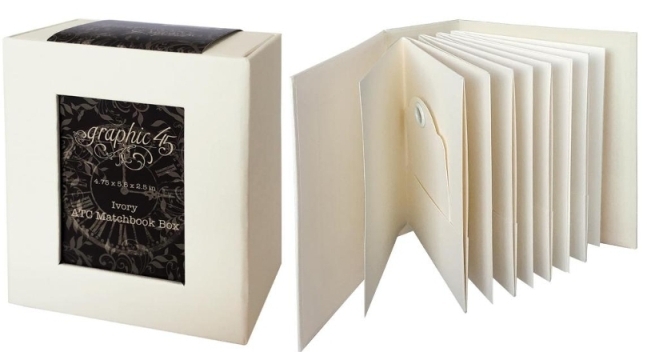 Beautiful pack containing flowers and dragonflies. 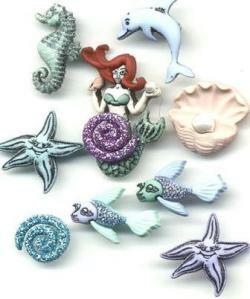 Superb embellishments for card making and scrapbooking. A colourful selection of flatback bright open flowers. 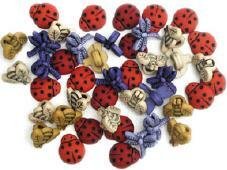 Superb embellishments for card making and scrapbooking. 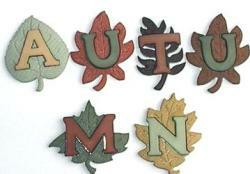 Lovely autumnal pack containing an array of beautiful leaves, including gold leaves. Each flat back leaf measures approx 7/8". 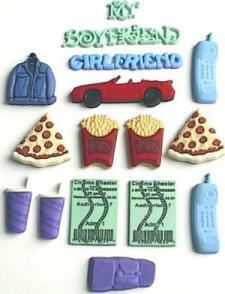 Superb embellishments for card making and scrapbooking. 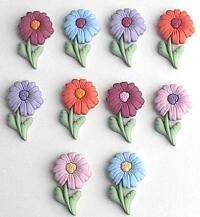 3/4" siwrl centred flowers in a variety of lovely colours. 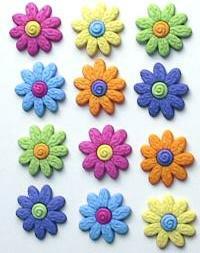 Superb embellishments for card making and scrapbooking. 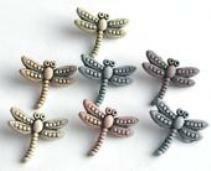 1" Dragonflies. These are stunning, but sadly they have been discontinued by the supplier. Stock is therefore limited.. 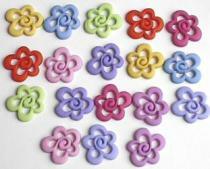 Superb embellishments for card making and scrapbooking. 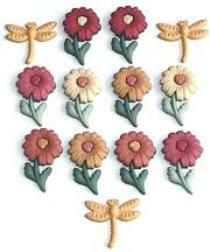 Tiny 7/16" Ladybirds, Dragonflies and Bees. 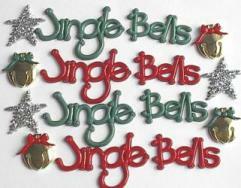 Superb embellishments for card making and scrapbooking. 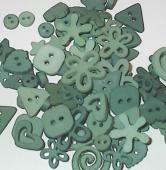 1/2" small flatback flower buttons in assorted colours. 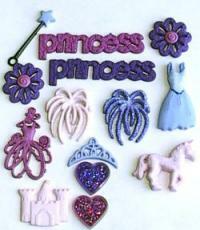 Superb embellishments for card making and scrapbooking. 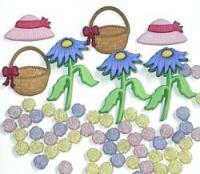 Pack consisting of assorted coloured coneflower, hats and basket buttons. 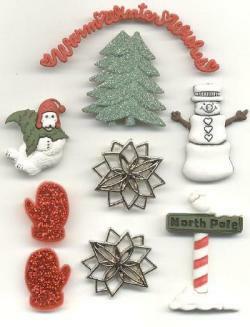 Superb embellishments for card making and scrapbooking. 1 1/2" flowers are shank-back. hats & baskets are flat-back. Pack of cute bee shaped buttons. 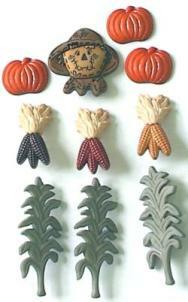 Superb embellishments for card making and scrapbooking. This great special includes a total of 50 pieces for only £4.99. 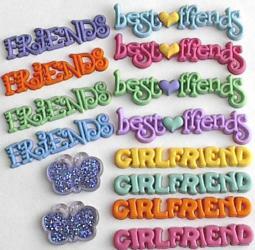 Included are 14 pieces of the 'Be Mine' word piece and a total of 36 of the glitter hearts. 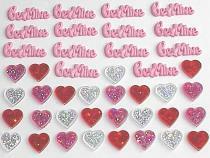 The 'Be Mine' word piece measures approximately 1 1/4" wide and the glitter hearts measure 1/2" in height. All pieces are flatback. Beautiful 1" flat back.open twig heart buttons. 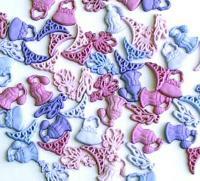 Superb embellishments for card making and scrapbooking. 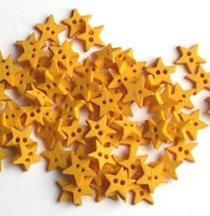 Bright coloured stars with contrasting centre colour. 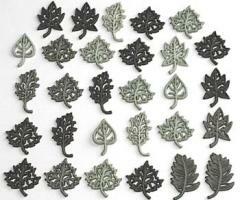 Superb embellishments for card making and scrapbooking. 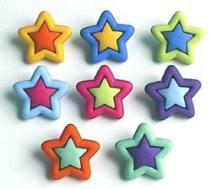 Brightly coloured micro-mini stars. 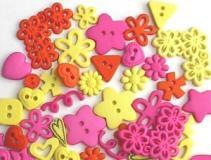 Superb embellishments for card making and scrapbooking. 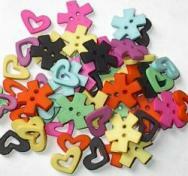 3/4" wide flat-back funly heart buttons in assorted colours. 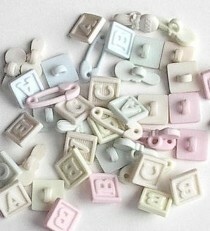 Superb embellishments for card making and scrapbooking. 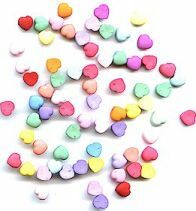 Tiny heart buttons in an assorted of colours. 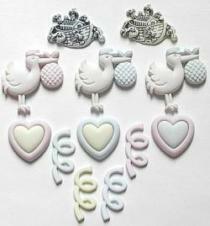 Superb embellishments for card making and scrapbooking. 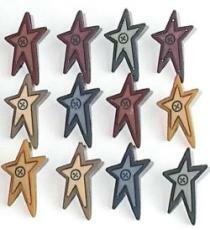 Lovely country-look stars in muted colours. 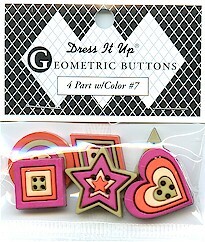 Superb embellishments for card making and scrapbooking. 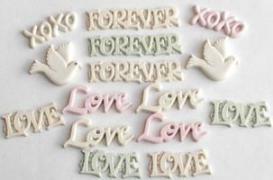 White doves and banners, depciting sentiments such as "Forever" and "Love" in pastel colours. 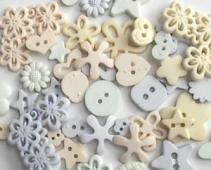 Superb embellishments for card making and scrapbooking. 1 1/2" wide 'Forever'. Flat backed. 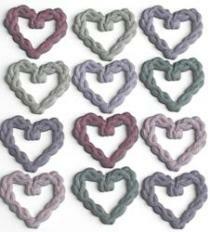 Banners, hearts and flower buttons in lovely pastel colours. 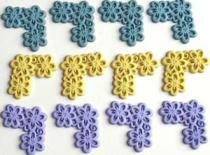 Superb embellishments for card making and scrapbooking. Banners and butterflies in a "Best friends" theme. 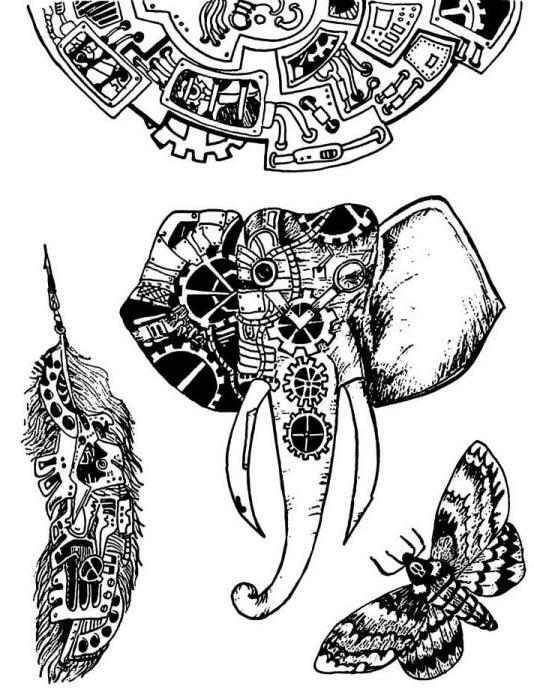 Superb embellishments for card making and scrapbooking. 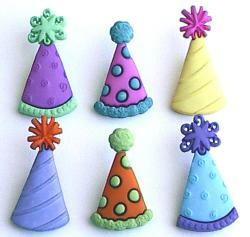 1 1/4" Party Hats in assorted colours. 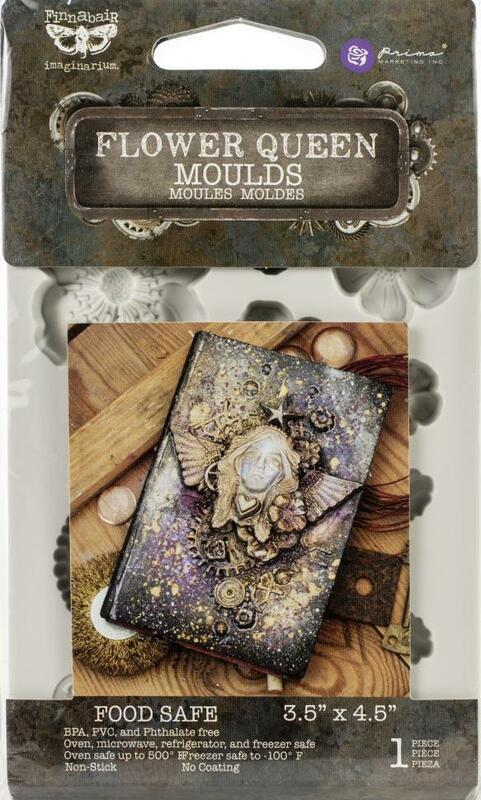 Superb embellishments for card making and scrapbooking. 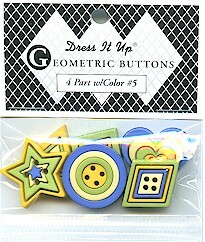 Larger sized buttons ideal for scrapbooking or frames. 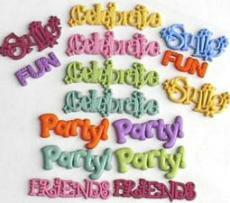 The pack contains streamers in assorted colours, plus buttons in various party shapes spelling the word "PARTY". 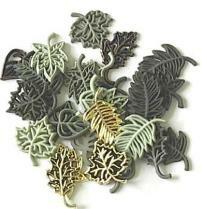 Superb embellishments for card making and scrapbooking. Brightly coloured wrapped presents. 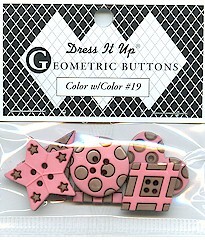 Superb embellishments for card making and scrapbooking. Flatbacks. Approx 3/4" in height. 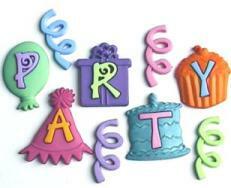 Birthday banners in assorted colours. 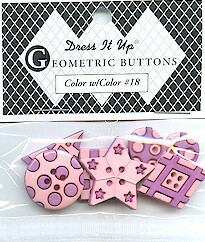 Superb embellishments for card making and scrapbooking. Pack featuring an assortment of birthday goodies, such as banners, candles, presents, candles, streamers and balloons. 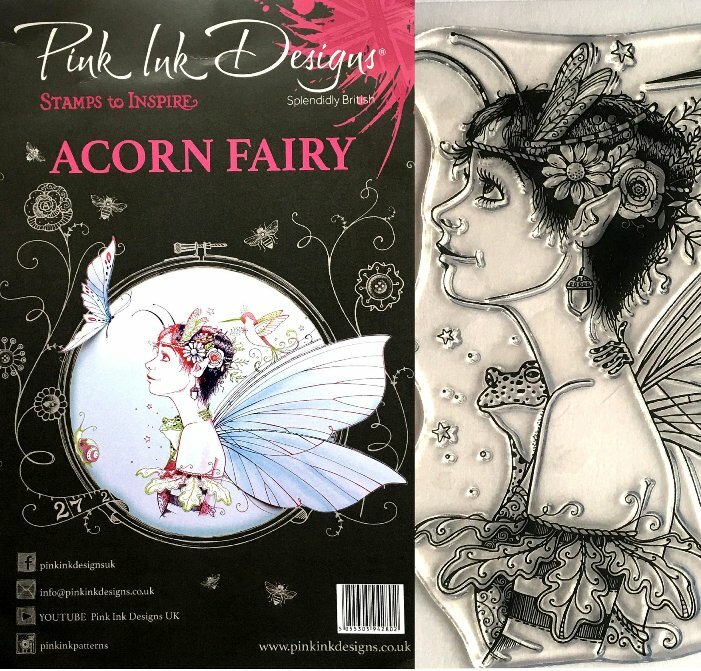 Superb embellishments for card making and scrapbooking. Dress It Up - Party! Pack containing various party sentiment banners. 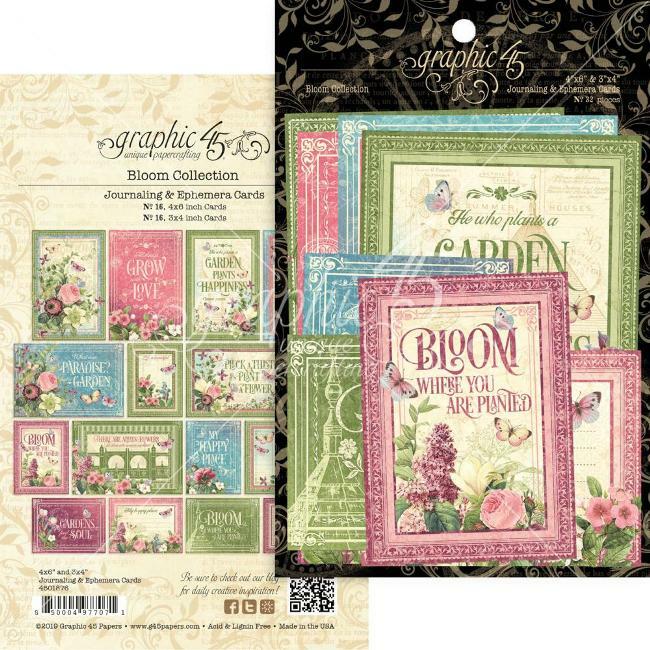 Superb embellishments for card making and scrapbooking. Approx 1 3/4" wide 'Celebrate'. This "Party Time" pack features small presents, party hats, streamers, hearts, stars, and party balloons. 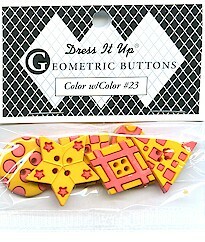 Superb embellishments for card making and scrapbooking. 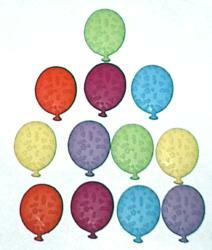 Brightly coloured balloons in assorted colours. 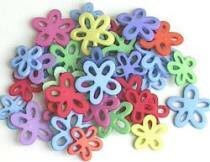 Superb embellishments for card making and scrapbooking. 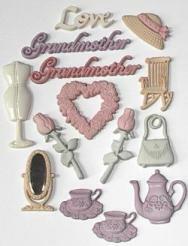 Remembering Grandmother features flat back buttons in the shapes of a rocking chair, mannequin stand, handbag, rocking chair, roses, hat, teapot and cups, roses, heart and banners. A beautiful set of buttons! 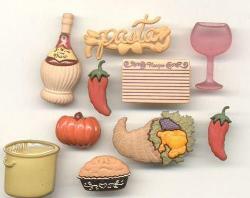 Lovely homely set comprising various kitchen objects. Posh pack of kitty buttons. 1.25" tall kitty. 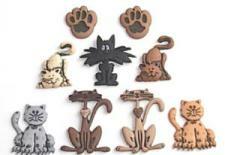 A super assortment of cats and paw prints. All buttons are flat back. 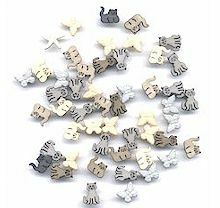 Pack of loads of itty bitty cat buttons. 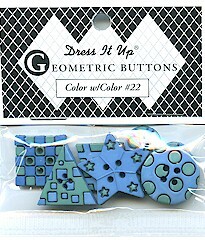 Pack also includes paws and other cat themed buttons. Cute puppies in assorted brown colours. 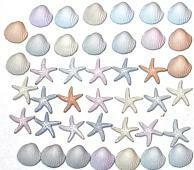 Lovely pack consisting of a pastel assortment of starfish and seashells. 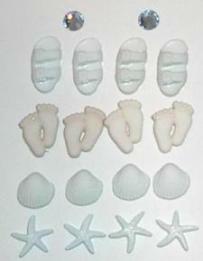 A walk on the beach - featuring sandals, feet, seashells, starfish and round crystal buttons in pastel hues. NOTE: Available colour scheme is Dark Pink/Light Green/Black and not the colours in the picture. A colourful selection of flatback bright open flowers. 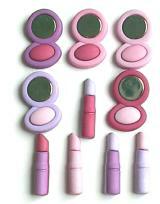 Beautiful pack of assorted shapes and pastel colours. 30+ Pieces. Colourful mix of shapes in bright primary colours. Beautiful mix of shapes in assorted colours. Shapes includes hearts, scroll corners amd flowers. Beautiful mix of shapes in muted pastel colours. Shapes includes daisy corners, daisies and hearts. Beautiful mix of shapes in brightl colours. 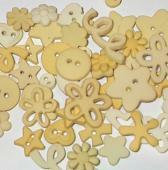 Shapes includes daisy corners, various flowers and stars. Beautiful mix of shapes in muted Victorian colours. Shapes includes daisy corners, various flowers and hearts. Mixture of shapes in muted mauves. Mixture of shapes in muted plum. Mixture of shapes in shaes of yellow. Mixture of shapes in shades of green. 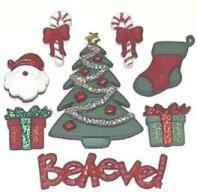 Christmas pack featuring candysticks, Christmas stars and various seasonal wording: "Believe! 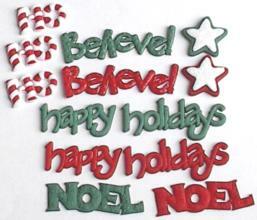 ", "Happy Holidays" and "Noel" in red and green colours. 2" wide 'Believe". All are flat backs. 2 1/8" high Christmas Tree. Candy canes & Santa are shank-back. Remaining are flat-back. 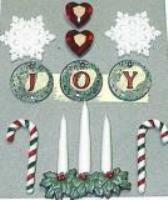 Lovely Christmas pack consisting of a three-candled centrepiece, snowflakes, candy sticks, and other Christmas embellishments. 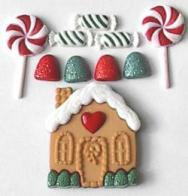 Christmas pack conisiting of a 5/8" high Gingerbread House, and Christmas candies. 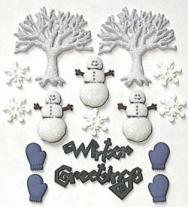 Lovely "White Christmas" pack consisting of 1" high glitter snowmen, white trees, snowflakes, gloves, and "Winter Greetings" wording. Cool Christmas pack consisting of Glittery Mittens, Christmas Bear, North Pole sign, Christmas Trees, Snowman, Snowflakes, and "Warm Winter Wishes" wording. It sure looks cold out there!! 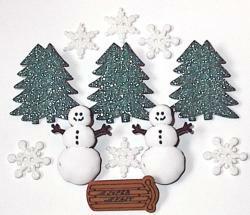 Pack contains snowmen, trees and snowflakes. 1 3/8"high snowman. All are shankback/ 2 hole. 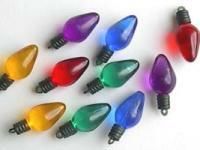 1" Christmas Light buttons in assorted colours. 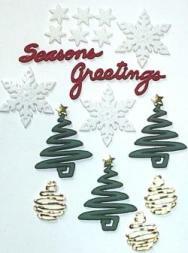 Pack contains "Swirly" Christmas trees and baubles, large and small Christmas stars/snowflakes, and red "Seasons Greetings" wording. 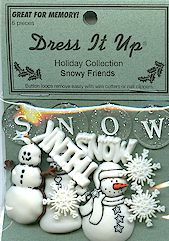 Three types of snowmen, plus snowflakes "Snow" & "Think Snow" wording. 1 1/4" high "no hat snowman" is shank back. Remaining pieces are flat back. 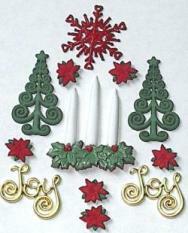 Beautiful Christmas pack consisting of a three-candled centrepiece, "Joy" wording, green trees, red Christmas flowers and large snowflake. 1 3/4" centrepiece. All are flat back . Contents may differ. 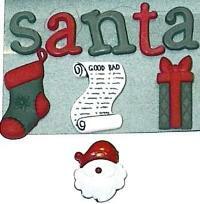 Pack comprises Santa, Santa List, One 1" tall present, one Christmas Stocking. Letters spelling "santa"
Santa head is shank-back, the rest are flat-back. 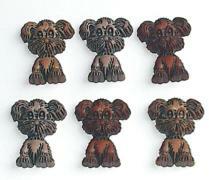 Pack comprises 1 3/8" high teddy bear. 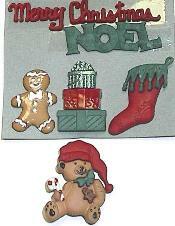 Gingerbread cookie, Stocking, stack of presents, wording "Merry Christmas" and "Noel". 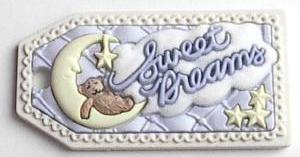 Page Title spelling "LULLABY". 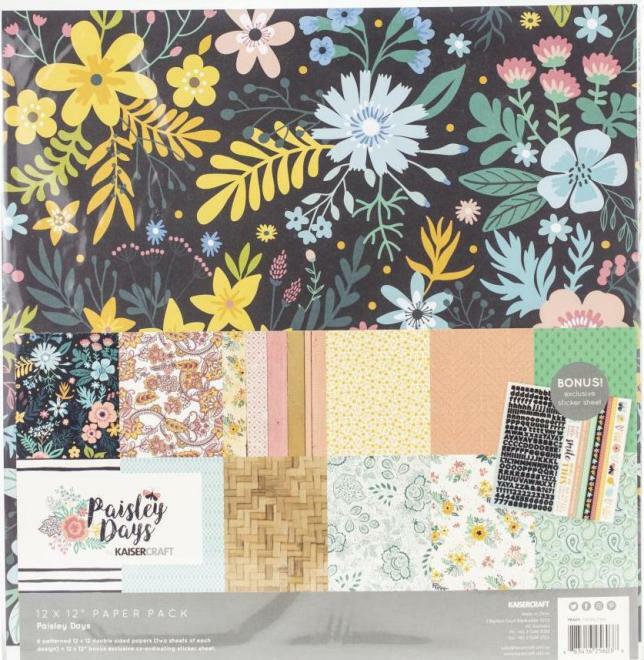 Fab for both scrapbooking and card making. 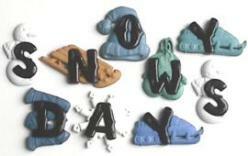 Each letter is embellished with a toy animal. 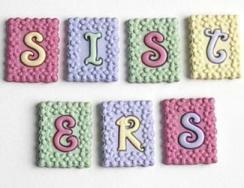 Letters are 1" tall approx. Flat-back. Each individual letter is on a different method of transportation, aeroplane, train, car and so on. This pack has it all - ghosts, monster, flying witch, Jack O'Latern, Booty bag plus "Halloween" wording. 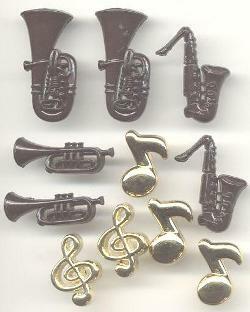 Pack of large shiny gold and black musical notes and instruments. 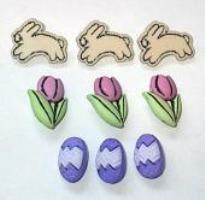 Leaping bunnies, Easter eggs and Spring flowers make up this lovely Easter pack. 1" flowers. Dress It Up - Congrats! 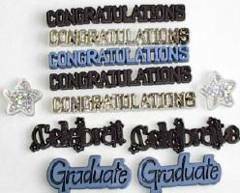 Celebrate the successful student with this great pack featuring various banners depicting wording such as "Congratulations" and "Celebrate", plus glittery stars. Cool little retro pack consisting of smiling faces, peace signs, flowers, and sunglasses, in bright colours. Pack of large 20mm wide smiley faces. Shank-backed. 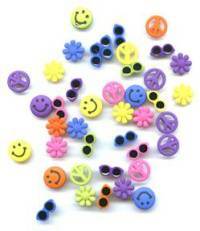 Pack of large 20mm wide assorted colours smiley faces. Shank-backed. Great pack suitable for both baby boys and baby girls. 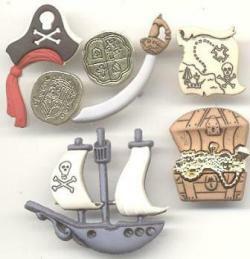 Pack contains Noah's Ark's, storks with bundles, hearts and swirls. Superb embellishments for card making and scrapbooking. 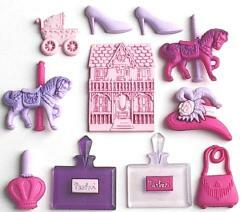 Assortment of pastel coloured baby blocks, shoes and other goodies. Superb embellishments for card making and scrapbooking. A few rattles are flat-back, remaining are shank. Single large tag measuring 2 3/4" in width. 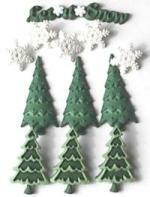 Superb embellishment for card making and scrapbooking. 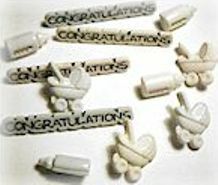 Pack consisting of baby bottles, prams and "Congratulation" banners. 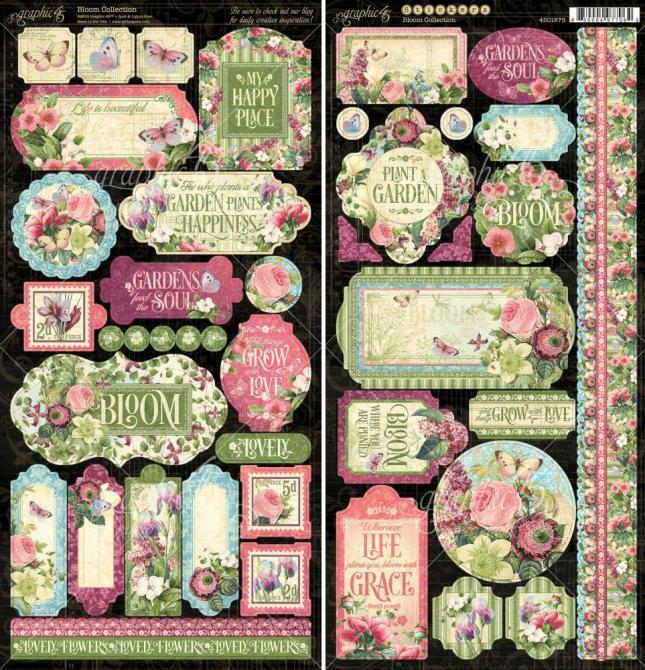 Superb embellishments for card making and scrapbooking. 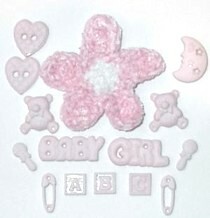 Baby Girl themed pack consisting of large towelling flower, moon, hearts, rattles, ABC blocks, teddy bears, and "Baby Girl" banner.Flat back. 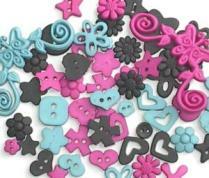 Superb embellishments for card making and scrapbooking. 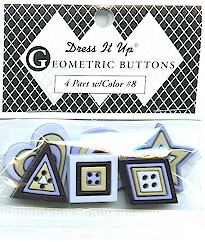 Pack of lovely geometric buttons.